This is a government-led programme that seeks to provide environmental externalities while directly tackling poverty issues. This South African Government programme aims to alleviate poverty through the provision of temporary work and skills development on watershed enhancement projects involving mainly the removal of Invasive Alien Plants (IAP). Environmental benefits have been confirmed and although most of the funding comes from the government’s poverty relief fund, water users also contribute either through the government’s water management fees or through individual regular donations. This is essentially an intra-sectoral transaction: government paying to secure environmental services (mostly) on government-controlled lands, and as such is not a Payment for Watershed Services (PWS) by definition. However, the Department of Water Affairs and Forestry has been trying to encourage voluntary payments from private and municipal actors with catchments infested with invasive plants. A few municipalities, state-owned utilities, and private companies have paid into the WfW programme in order to have WfW teams clear invasive species from their catchments, and they use the institutional structure provided by WfW. 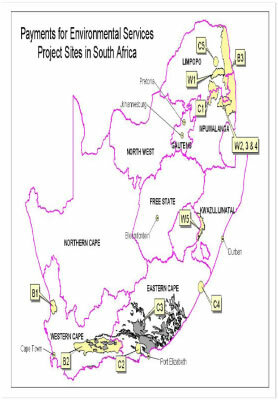 Programme launched in 1995 and administered by the Department of Water Affairs and Forestry(DWAF). Water scarcity due to low rainfall (65 per cent of South Africa receives less than 500mm annual average rainfall) and stream flow reduction due to the growth and spread of the rapidly spreading IAPs that consume large quantities of water. These IAPs also cause other environmental problems such as increased flooding, fires, erosion, siltation and strain on indigenous species. “If we do not clear invading alien plants in 10 to 20 years we will lose 30 per cent of our run-off to rivers. In 20 to 40 years 74 per cent will be lost" (Working for Water Annual Report 2001/2). Beyond these environmental goals, the main driver of this programme is really poverty alleviation through the creation of employment in the programme’s plant removal projects- “workfare”’ (DWAF, 2006). Private, communal and public land in priority mountain area catchments. Local rural contractors, funded by the programme, carry out work in 300 project sites. Unclear whether, when in private land, the landowner is involved. In total, 10 million hectares have been identified for clearing over 20 years. Most of WfW’s activities are on public lands. For private land where the owner has not paid for WfW services, preference is given to emerging farmers (full funding) and land that is deemed a priority with regard to the “holistic clearing strategy” of WfW (80 per cent funding for first two clearings, 60 per cent for third). Private land that is not deemed a priority may be given incentives in the form of expertise, herbicides, or a maximum of 50 per cent funding (Ferraro 2009). The Department of Water Affairs– annual contribution to the WfW programme amounts to about R58 million. The water price charged to its users (33,000 domestic, industrial, agriculture and forestry water users), includes a “water resource management fee”. This fee covers clearing of IAPs as well as planning and implementation, pollution control, demand management, water allocation and water use control). The public company Trans-Caledon Tunnel Authority (TCTA), the specialised liability management body for bulk water supply has also contributed R8 million to the WfW programme (over three years). Some Local governments, interested in preserving or increasing water supply, contribute to the programme with regular annual donations to fund the removal of IAPs in the catchment areas from where they derive their water. In the Hermanus municipality, for example, a block rate tariff was introduced to control high water use and a significant percentage of the revenues collected are transferred to the WfW programme. Similarly, Georges Municipality has committed R400,000 per year to the programme as a parallel investment to the new augmentation scheme to supplement the capacity of its Garden Route Dam. The government directly administers the programme. The Department of Water Affairs and Forestry, Department of Environmental Affairs and Tourism and the National Department of Agriculture. Water quantity, flow regulation and erosion control. Rehabilitation of degraded ecosystems: removal of invasive trees, like pine and eucalyptus or acacia bushes, through physical felling or uprooting, bio-control, controlled burning or herbicides. Where appropriate, removed plants are replaced by native species (many of the areas being cleared were originally grasslands and trees are not replanted). Direct negotiation (government); user fees and pooled transaction. WfW Programme (Department of Water Affairs and Forestry) receives funding from several government sources and commissions local contractors to carry out the plant-clearing work. Users contribute with cash payments. Providers, considered here as the owners of the land where the clearing works are carried out.Unclear whether private or communal landowners contribute to the works in any way, as it is in their own interest to collaborate since it helps them comply with legislation requirements (see Legislation Issues). The annual budget is currently half a billion Rand (approximately US$66 million), nearly all coming from the Government’s Poverty Relief Programme (R414 million in 2003/4), while the water users contribute R58 million a year(Turpie, 2004). According to Ferraro (2009) WfW’s annual budget is currently a little over US$70 million, with approximately 80 per cent from general tax revenues from the central government through its Poverty Relief Fund. The next largest contribution (almost the rest of the budget) comes from the Department of Water Affairs and Forestry’s general budget, about which a little more than half comes from “water resource management fees” charged in 13 of the nations’ 19 Water Management Areas. In order of decreasing importance, foreign donors, municipalities, and the private sector comprise the remaining small fraction of the WfW budget. Programme costs are: 10 per cent in management fees, 30 per cent in materials and transport and 60 per cent salaries. restoration of the productive potential of the land (particularly in relation to pasture lands, that due to the invasion of alien species, lose their grazing value considerably). Avoided costs: savings for the respective water boards through reduced water management and rehabilitation costs. Over the last two decades, South African scientists have developed a strong scientific foundation that documents the effects of invasive plants on the South African environment and the most effective methods for controlling them. Invasive plants are estimated to use seven per cent of all water resources, as well as intensifying floods and fires, and threatening native biodiversity (Ferraro 2009). About one million hectares of IAPs was cleared over the past seven years, which has yielded an estimated release of 48 –56 million cubic metres of additional water per annum (DWAF, 2006). · Threats to aquatic fauna and biodiversity through the combined effects of the above on the extent, distribution and quality of micro and macro habitats comprising freshwater ecosystems. It is also known that IAP’s increase the intensity of fires and exacerbates environmental damage due to its high fuel load (DWAF, 2006). Employment benefits: the project engages mainly with the groups most affected by poverty and unemployment, focusing on women, youth and disabled individuals. It provides work for up to 24 months of work over a five year period, the average employment period being four to eight months every year. More than 20,000 beneficiaries, previously unemployed, received gainful employment and training through the programme annually. Over 15 million person-days of employment have been generated by WfW. Costs per job created are also the most efficient of all of the poverty relief programmes of national government. Although the programme does little environmental targeting, it engages in strict social targeting. Part of the WfW’s mission is to encourage small business development as a form of social empowerment in poor communities. The WfW system encourages small-business entrepreneurs (particularly less experienced ones) to bid on WfW contracts for land management units where IAP removal has been identified as important to increase water flows (Ferraro 2009). Independent contractors focus on employing low-skilled, unemployed citizens; with a particular emphasis on women, youth, and the disabled (including HIV-infected individuals). Wages are set by WfW, and contractors are instructed to hire only the formerly unemployed and achieve hiring targets for women, youth, and the disabled. Because of its emphasis on economic empowerment and working with largely unskilled labour in poor communities, WfW has a substantial training program. Although there is legislation assigning responsibility for management of IAPs to the landowners (Conservation of Agricultural Resources Act -CARA), in practice, this is not rigorously enforced. Monitoring is done though a database (WaterWorks)set up by WfW to collect data on and manage and control its in-field operations. A monitoring and evaluation (M&E) unit is developing an overall M&E framework to assess performance in the achievement of the six WfW goal areas: ecological, hydrological, agricultural, institutional development, economic development and social-economic empowerment. One of the main constraints of the programme is securing sustained control of IAPs in cleared areas. This requires on-going follow-up or handover of land to landowners; it is unclear whether, once the land has been cleared, the landowners feel a greater obligation to maintain the land and prevent future infestation of IAPs (DWAF, 2006). Given that the programme is government-led, the bureaucratic process often results in delays in payments and contract approvals, which can be especially harmful for the vulnerable groups with which the programme works (DWAF, 2006). Extensive research on the environmental impacts of IAPs has provided the base for the work developed by the WfW programme, and real improvements in water quantity have already been realised. In addition, the programme aims at fulfilling its environmental goals, through the provision of social benefits to the most vulnerable groups, and the combination of both has earned the programme wide national support (and increasing funding, both from social and environmental interests) as well as 35 national and international awards. Other proposed projects in South Africa include: (a) Ga-Selati River, Olifants Catchment project; (b) Maloti- Drakensberg Transfrontier project; and (c) three initiatives in the Sabie River, Sabie-Sand catchment. There are also a variety of Payment for Environmental Services (PES) schemes being proposed across the country(See figure from King et al,, 2005). In an updated inventory by Katoomba, Bond (2008) reports that Ga-Selati and Sabie River (Sandton Bird Club Site and game farmers) were terminated because there was no demand and very little sense of the potential benefits. High start-up costs for designing and implementing PWS programs in Africa is certainly a factor in why so few programmes are up and running and in why those that are functioning are either dependent on donor funding or government support (Stanton et al 2010). There tends to be a pattern where schemes begin with a trial phase over a smaller area, hoping to prove the concept to prospective buyers, though this approach has not yielded much scaling up thus far. A review of PWS schemes carried out by the Katoomba Group between 2005 and 2006 and revisited in 2008 found that many of the initiatives identified in 2005 were still not operational by 2008, partly due to lack of start-up funds (Bond 2008). Further information on the impacts of IAP (from the South African Journal of Science) is available on the WfW website at http://www.dwaf.gov.za/wfw/Docs/. Bond, I., 2008. Payments for Ecosystem Services in East and Southern Africa: assessing prospects and pathways forward, in: Group, E.S.A.K. (Ed. ), Scoping of Potential Payment for Ecosystem Service Sites. The Katoomba Group. Ferraro, P. (2009). "Regional review of Payments for Watershed Services: Sub-Saharan Africa." Journal of Sustainable Forestry 28: 525-550. IIED. 2005. Fair deals for watershed services: learning from new attempts to develop pro-poor payments for watershed services. Draft Discussion Paper. International Institute for Environment and Development, London. Le Maitre, D.C., Versveld, D.B., Chapman, R.A., 2000. The impact of Invading Alien Plants on Surface Water Resources in South Africa: a Preliminary Assessment. Water SA 26, 397-408. Stanton, T., Echavarria, M., Hamilton, K., Ott, C., 2010. State of watershed payments: an emerging marketplace. Ecosystem Marketplace. Swallow, B., Leimona, B., Yatich, T., Velarde, S., Puttaswamaiah, S., 2007. The conditions for effective mechanisms of compensation and rewards for environmental services, CES Scoping Study issue Paper no.3. World Agroforestry Centre, Nairobi, Kenya:. Swallow, B., Kallesoe, M., Iftikhar, U., Van Noordwijk, M., Bracer, C., Scherr, S., Raju, K.V., Poats, S., Kumar Duraiappah, A., Ochieng, B., Mallee, H., Rumley, R., 2009. Compensation and rewards for environmental services in the developing world: framing pantropical analysis and comparison. Ecology and Society 14. Turpie, J.K., Marais, C., Blignaut, J.N., 2008. The working for water programme: evolution of a payments for ecosystem services mechanism that addresses both poverty and ecosystem service delivery in South Africa. Ecological Economics 65, 788-798.